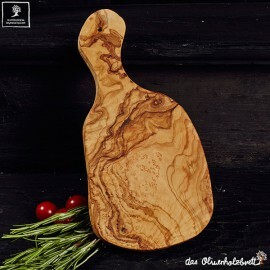 Typical cutting board mediterranean style, with handle. Available in several sizes. 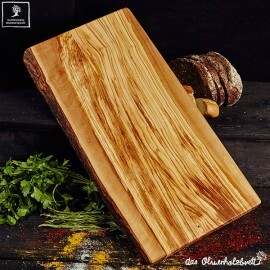 Rectangular olive wood cutting board, perfect for breakfast and snacks or cutting herbs and vegetables. 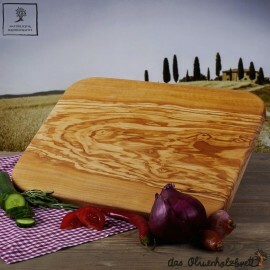 Rectangular olive wood chopping board, perfect for cutting herbs and vegetables. There are many reasons why olive wood is one of the most popular woods worldwide. Its is simply very durable and resistent, so its more inured to scratching, cutting and external impacts compared to many other woods. 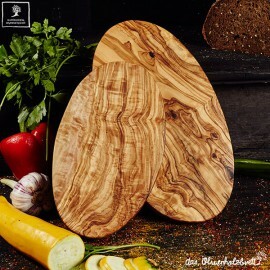 So ideal for every day use in the kitchen.The beautiful and individual grain of each olive wood product makes it unique and therefore always a real eye-catcher. As the trees grow very slowly, the wood becomes particularly hard and dense. The result is a raw material that stands out for long-term investment and especially for high-quality products. 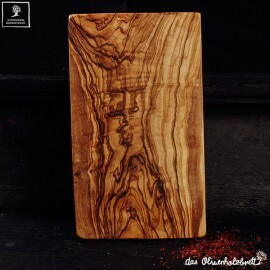 Olive wood is ideal for the kitchen, especially for chopping boards. 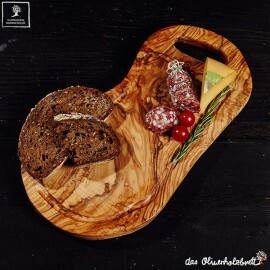 Snack baords, kitchen boards, serving boards, cheese boards, steak boards, breakfast boards, coasters and even olive wood bowls are very popular products. Its hardness makes it ideal to cut food on it and is still beautiful to look at and easy to keep clean. 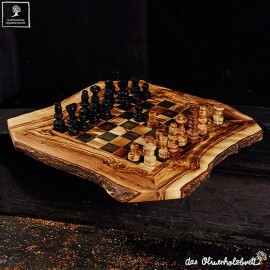 Chess games, handles of knives, spoons, forks and olive wood mortars are also commonly made. 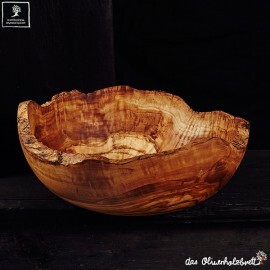 How to care olive wood products? The wood is durable, resilient and requires little care. Rinse with lukewarm water is usually perfectly sufficient to provide a shiny, beautiful surface and avoid that olive wood products become brittle. You decide for a material that will be preserved for a long time and never goes out of fashion. 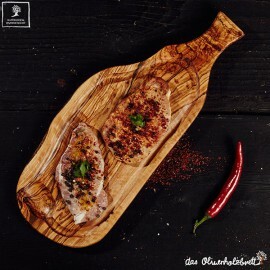 For example cutting boards out of olive wood are particularly well suited to every barbecue or dishes with steaks, meat, sausages and ham but also for offering cheese and antipasti. The bigger bowls are perfect for offering salad. Medium sized bowls are ideal for side dishes like rice, potatoes or vegetables and the samll bowls are useful for every kind of dips or serving small snacks like olives. 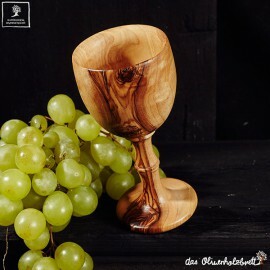 Grapes, figs and other Mediterranean fruit can be presented on olive wood. 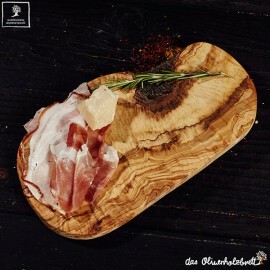 But even sandwiches or finger food could be delivered on a olive wood board or tray. Small boards are perfect for cutting garlic and onions, but also usefull for serving bread and butter. 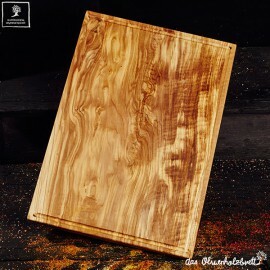 We deliver cutting boards come in sizes from about 20cm to 60cm, but also sizes up to 1,20cm are possible. Please ask us for this over average big and unique pieces. For hotels, restaurants and catering companies we offer also logo branding for their serving boards, salad server or spoons. Topseller are the cutting boards with average dimensions of 40 cm - Because they are ideal for cutting bread, chopping salad and vegetables, chopping herbs and in parallel you can use them as a serving board for all kind of dishes. So if you buy one board you get always two benefits - The beauty of this wood + functionality. 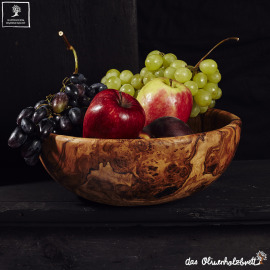 Yes, olive wood products are a perfect gift for every ambitious and demanding customer, as well as for people who focus on functionality during cooking and last but not least especially for all people who love the beauty of this wood. Our chess games for example are a real individual and unique gift for every chess player. Salad server as a Christmas present / gift for employees, colleagues or customers? Salad is a very popular side dish which is often prepared rather quickly as a main course. Just add a few matching salad and vegetable ingredients in a bowl, sprinkle with oil and vinegar, a Pinch of salt and pepper….stir well ….and done.